A product review this week: Over the last couple of months here in Perth, the Swim Smooth team have been putting a new swimming gadget through its paces. After extensive testing we have found it extremely beneficial in improving a swimmer's stroke technique, pacing skills and get the most out of their fitness training. Suffice to say we're very impressed! SwimSense on our website here. 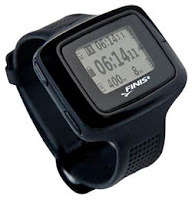 The Finis SwimSense is a new design of swimming watch (called a 'Performance Monitor' by Finis) which measures how far you swim, your speed, your stroke count and your stroke rate too. The watch uses motion sensors to record data accurately for every lap you swim and makes this easily available for analysis both on the watch screen and by downloading to your computer. We've tested every similar device on the market and the SwimSense is more accurate and much easier to use than anything else out there. Check out Paul Newsome's in depth look at the watch here. - The SwimSense records your total training distance, training load and calories burnt every session. It captures the structure of every session exactly as you swim it so you get a complete record of every workout in the pool. The SwimSense's software is very easy to use. - Monitor your pacing skills with the split times taken on every lap. As you'll know from this blog, good pacing skills are absolutely essential to train effectively and increase your swim fitness. Most swimmers start every swim or interval too quickly and then fade, this greatly harms the effectiveness of their training. If you are on a performance plateau then your pacing in training and races is the first thing to look into. - Assess your pool performances accurately. If you've swam in a race or training swim and not performed as expected, the data from the SwimSense will help you diagnose what went wrong and point out where to improve your performance next time. - Full integration with Training Peaks and WKO+. If you are triathlete using a power meter on the bike, and a GPS or Footpod when running, then the SwimSense completes the picture allowing you to measure your complete training load in all three disciplines. For the first time you can now accurately include your swim training in WKO+'s Peformance Manager. - Boosts you motivation! 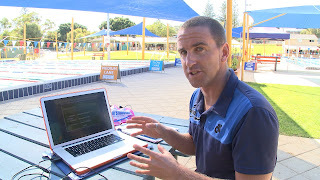 Our swimmers here in Perth have found that being able to record and track improvements in their sessions is very motivating, particularly for those that train outside of a squad or training group. They are even able to see small incremental improvements in performance that they would have otherwise missed. We like the SwimSense so much we're now using them every day with our swim squads here in Perth and have started stocking them on our website. For a short period only we're extending our free worldwide shipping offer to the Swimsense. Don't miss out on this great offer, pick up yours from our Swim Shop. - Run through a contrast set where you deliberately alter your stroke to experiment with how it feels. You'll be surprised what you learn and how different it feels from normal drill work. - Try swimming 400m at 90% effort (you might just set a PB). - Seek out conditions you would normally avoid, for instance when it's windy and choppy at the local lake. See how you need to alter your stroke to cope effectively in various conditions. - Equip some of your less experienced swimmers with fins and move some of your fastest swimmers to their lane to lead them through a high speed set. It's great experience for the novice swimmers and your top lane athletes will love the leadership role. - Practice open water skills in the pool with friends. Include drafting and sighting practice, and short sprints to surge and get on the feet of a drafting partner. Wear some fins if your friends are a bit quicker than you - this isn't cheating, it's a way of giving you the experience of drafting that you'd otherwise miss out on. - Experiment with changes to your stroke technique in your wetsuit. For instance looking further forwards, using less kick, trying a higher stroke rate and employing a straighter arm recovery. - Swim some longer distances without thinking about technique - perhaps to music from a waterproof MP3 player. Your body may settle into a more efficient swimming rhythm all by itself. - Try drafting close to the side and slightly behind a friend - breathe in towards them to judge the distance accurately. Get this right and you might get a bigger draft than when sitting on their feet. - Experiment with different breathing patterns, for instance try breathing every 3 strokes then every 5 strokes then every 7 strokes. It's amazing how much air you can exhale into the water during these longer durations (there's more in there than you might think) and how easy breathing every 3 feels afterwards. - Use a Wetronome to run through a variety of stroke rates over a set of 50m repetitions. See how they feel and experience different elite athlete's stroke rates along the way - e.g. Ian Thorpe's 76 Strokes Per Minute (SPM) and Emma Snowsill's 86 SPM. You might even like to give Laure Manadou's amazing 110 SPM a crack! Also try 45 SPM to see what Overgliding feels like (you'll feel the loss of speed and efficiency). 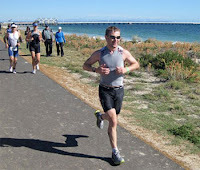 - Focus on perfect pacing rather than outright times during training sets. How consistent can you be with your times over the course of a set and also for each lap within each repetition? Elite distance swimmers have amazing pace judgement in races and training which lets them achieve peak performance. Try The Goldilocks Set, it'll test your pacing skills to the full! - Keep your brain engaged by training in a different length pool or an open water venue with different conditions and challenges. As a coach try putting your whole squad through some of the experiences above and see what each swimmer individually learns about their swimming. Because of their differing body types, skill and experience levels they'll each learn something different that's useful to them as an individual. Don't enter into too much technical explanation, instead throw in a few thought starting questions and relevant facts. At the end of the session your swimmers will be open and happy to share what they have learnt, which is the perfect opportunity for you to help them interpret their experiences. Our first story comes from the pointy end of the field. Pro Triathlete Guy Crawford produced the fastest swim split of the day, gapping the entire field with fellow pro Bryan Rhodes sat on his toes. A few weeks ago we did some work with Guy in the pool giving his stroke a little tune-up. Guy is a very accomplished swimmer and as you can see here, he is very tall with long arms. However, he had recently become a little reliant on kicking hard and had a tendency to over-reach at the front of this stroke which dropped his stroke rate. In training his performances had become a little inconsistent, fluctuating between good and bad sessions. In the pool we worked on tuning up Guy's catch technique to remove the over-reaching and lifted his stroke rate a touch using a Wetronome, improving the rhythm and timing of his stroke. We also raised his head position to make him more balanced when swimming in a wetsuit as Guy has a naturally strong six beat kick. If you're an analytical person yourself (perhaps an Overglider) it's worth noting here that Guy didn't over-think this, he kept it very simple in his mind and focused on the improved rhythm it gave him. Because of this he took the changes on board very quickly giving him an immediate benefit to take into the race. "I lifted my head heaps so my feet were a bit lower in the water, tried to increase my stroke rate and concentrated on my hands. 3 things: hands, feet, stroke rate and I felt awesome... I was swimming hard but ready to go if some-one came round me... just had that extra gear... Bryan Rhodes sat on my feet for the whole swim." 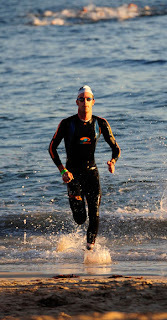 Our second story comes from age group triathlete Stuart Murray who is a strong cyclist and runner but in the water has those Arnie tendencies to overly shorten his stroke and fight things. Being a good athlete he's understandably been a bit frustrated with his swimming! In our recent video analysis session with Stuart we worked on removing the crossover from his stroke and increasing his body rotation to both sides. To help him do this we used a Wetronome to reduce his stroke rate, slowing him down from around 69 SPM (strokes per minute) to 63 SPM. This gave him a little more time on every stroke to extend forwards properly and avoid crossing over. With this improved alignment Stuart felt much better in the water and he's started to get a much better feel for his catch at the front of his stroke. It is important to note that we avoided dropping Stuart's stroke rate so low that he added a glide or pause as that would have have harmed his efficiency again. Instead we found Stuart's stroke rate "sweet spot" between fighting the water and adding a deadspot. After around 4 weeks of working on his stroke technique at this lower stroke rate we were able to raise him up slightly to 66 SPM to add a touch more rhythm for the race but still keep his better alignment and catch technique in place. Stuart had a great swim setting a 36:30 PB for the 1.9km distance, exiting right on the heels of many other athletes who would normally beat him out of the water by several minutes, and was still fresh for the bike leg. Making accurate adjustments to your own stroke rate can be very hit and miss without a gadget to help you. By simply timing your strokes to the perfectly timed beep-beep-beep of a Wetronome it becomes straightforward to adjust your stroke rate up or down depending on your individual needs and so develop a more efficient stroke. As an age group swimmer or triathlete you're likely to be in the 50 to 60 strokes per minute range at the moment. You will normally only need a change of between 3 and 5 strokes per minute in the right direction to find your sweet spot where your stroke starts to click and you experience an increase in your speed and efficiency. This stroke rate will be individual to you but the point here is that you're not looking for a radical change in your stroke rate at any given point in time. In fact, you might not need to change your stroke rate at all. If you feel lopsided, perhaps as the result of only breathing to one side, then a Wetronome can help even out your quick-slow-quick-slow stroke rhythm to develop a more symmetrical, efficient stroke. Find out more about the Wetronome stroke rate tool here and for further reading about stroke rate see here. How Fast Can You Swim Over Longer Distances? All around the world, long distance open water swimming races are growing in popularity. Swimmers are taking on the challenge of events from 1000m through 5km and 10km, right up to marathon swimming events such as the 34km English Channel and Catalina Channel swims. The table below is our estimation of your race pace over different distances. The figures are relative to your CSS pace which you can find using the test set here. CSS stands for Critical Swim Speed, which is very similar to lactate threshold or the concept of Functional Threshold Power (FTP) if you're used to training with a power meter on the bike. As you can see, CSS is approximately your 1500m race pace. In fact if you know your current speed over a very recent 1500m then you can use this as CSS in the table above instead of performing the CSS test. The figures in the table are only a rough guide as your ability to sustain a pace relative to your CSS depends on how fit you are, your fueling strategy and your physiological makeup. Those with a very good aerobic base will not see as much drop off in their pace over increasing distances as those with more of an anaerobic, sprint background.